So, last month my large data disk died. Right before I was going to back it up. I had been remiss due to the holidays (and more holidays, and back to school, etc.) And had not backed up in what turned out to be a really long time. So as I’m desperately trying to remake my project from old backups, demos I posted online, random files from my laptop and anything else floating around. I did OK, getting pretty close to my last working version when I had something of an epiphany / revelation / slap to the head. It wasn’t very much fun. Well, I told myself – that’s rather the point. Its about how crappy people can treat each other, and what its like to be on the receiving end of peoples disgust and scorn. After replaying it to test if I had missed anything, I came to the ego-bruising realization that it wasn’t very good. Also, it was slowly dawning on me that I broke a cardinal rule of game development: start small. Not that my ‘game’ was a sprawling 60 hour MMORPG with multiple branching storylines; it was nothing more than a static environment with a few interactable NPCs and triggered events. Turns out even that was too complicated. 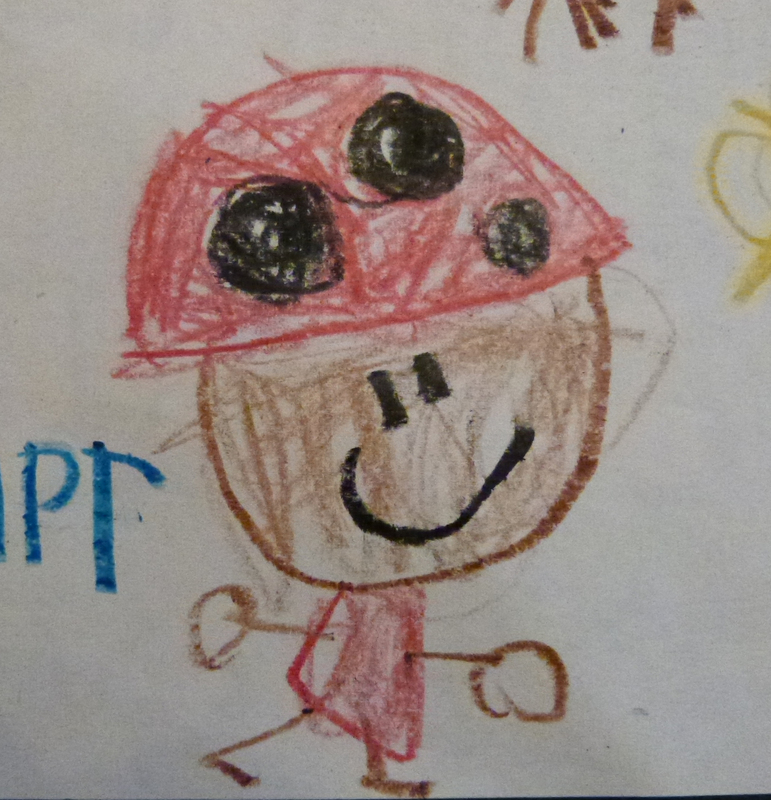 and it just struck a chord with me… My son is 6, on the spectrum (non-verbal) but has drawing talent that is better than mine at a similar age. I’ve always envisioned making a 2D platformer with his work but that is a whole different beast from the 3D VR work I’ve been doing and would require more learning, more time away from other projects – time I really don’t have to spare. So, as I’m sitting at my desk, my 6 year old wanders into the office and plops down on my lap and grabs my Vive, looking into my eyes and silently prompting me that he wants to look inside. I shift him around and open up a test Unity project (thanks VRTK for having simple projects to tinker with!) and throw the image above on a plane and slap a quick character controller on it and hit play. 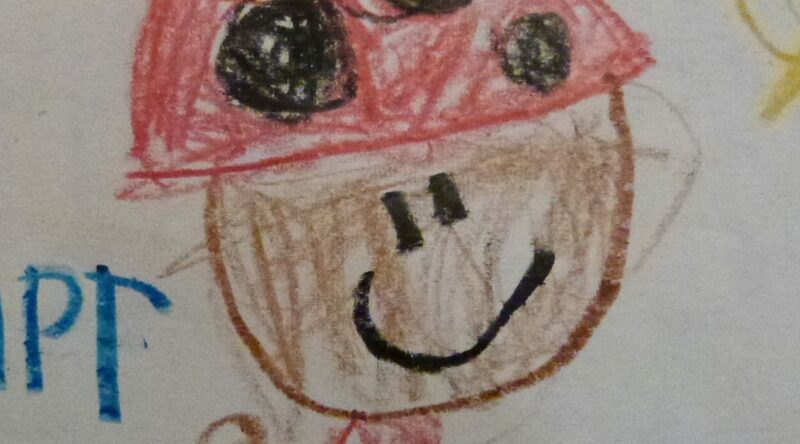 Number One son positively howls with delight as he sees his drawing moving around on a flat plane, me controlling it with WASD as he looks around clapping his hands and laughing. I grab my Steam Controller and turn it on, a nice surprise when it controls my character as well and thrust it into the kids hands. He’s even more excited now that he is controlling the action and laughs as he repeatedly steers the character off the ‘world’ and plunges into the depths below. My wife walks in and informs him its time for bed and I get teeth brushed and tuck him in, kissing his little head and smiling at his delight. I throw the character into Spriter Pro (an impulse purchase off of Humble Bundle) and give him (her?) a quick walk cycle and re-import back into Unity – its even better. 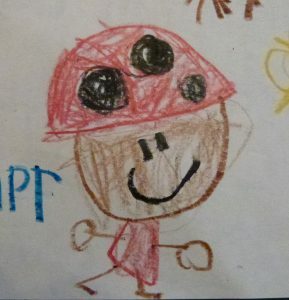 I put his drawing on Facebook, to see if it resembles anything (particularly, a trademarked character) and people give me answers like, ‘lady bug construction hat’ or ‘African American lady bug superhero’ – so I’m kinda content that he’s not copying a kids book or game he’s played. I throw in a few more drawings and screen cap the above footage and show it to the gang at the VRTK Slack channel. They LOVE it – I get a ton of ideas thrown at me (including the near impossible one of making it like Scribblenauts and have the player draw solutions to level puzzles) and I need to copy and paste all of them into a word .doc to keep track of them all. So – I think I’m breaking another game dev rule: don’t get excited about a new project without finishing your current one. Looks like I enjoy breaking rules and I’m getting sucked into a simpler, more attainable goal.